If you’re a French speaker then get a copy of the latest issue (#85, Dec 2012) of this great French prog magazine Big Bang, featuring Steve Hackett, Marillion, Ian Anderson, Neal Morse, Threshold… and us (article and interview). Yes, somehow we managed to crack the top ten there with Honey and Lava, at least on main man Brad Birzer’s best-of list. Not bad for a self-financed, self-produced/recorded/mixed album by a bunch of unknown amateurs (two of whom have gammy legs from the war). Eight. Coralspin, Honey and Lava. Blake McQueen is a master. The production on this album is outstanding, as it plays out the big sounds of Trevor Horn and Trevor Rabin. Soaring and rocking in every way; the lyrics are quite good, too. What’s more, Brad says 2012 was the best year ever for prog. His call, not mine — you’d think that our presence there automatically invalidates that claim! I haven’t actually listened to a lot of the material on that list, but I do love The Fierce and the Dead’s On VHS mini-album. Will have to check some of the other bands out. (I am of course a big Rush fan, but haven’t got around to Clockwork Angels yet, only up to Snakes and Arrows). 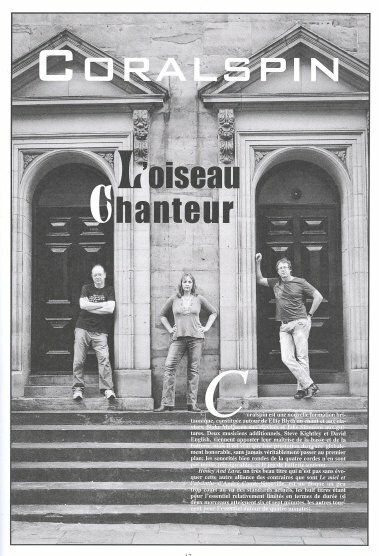 There’s a profile of us in the ‘Limelight’ section in issue 31 (Nov 2012) of Prog magazine (out in newsagents in about a week, maybe less). Thanks to Sarah Worsley for the very entertaining interview, Russell Fairbrother, Prog’s art guy, for the nice layout, and Roley for the help. And thanks again to Dom Henry who we got to do the photo. Coralspin are a curious bunch. Imagine the sparkly-caped tinklings of Yes mixed with Queen’s classical guitar virtuosity and a sprinkle of Kate Bush’s idiosyncracy. Now, if that doesn’t get your prog synapses twitching, nothing will. One aspect of Coralspin’s unique take on modern prog is that keyboards outnumber guitars two to one. “The good thing about them is there’s a variety of sounds to choose from,” says keyboardist Blake McQueen. “With a guitar it’s kind of one sound all the time. Most of the variety in music comes from the keyboards”. Blyth’s current career as prog maestro is a far cry from her days in the Oxford Pro Musica Singers. But, as she explains, a desire for change spurred her to rebel. “I always wanted to do something like this but, coming from a classical background, my teachers said ‘you can’t do that, stick to what you’re doing,'” she laughs. Sounds like: Brian May and Rick Wakeman’s prog child. The “devoted ten years to the Coralspin sound” is true in that about ten years ago (actually it was about 8 really, but I said 10 for some reason), I started putting my studio together, started learning how to record and mix, and started writing Coralspin-like songs, and Ellie did too. I was a bit vague about this to Sarah because Coralspin’s origins are themselves a bit vague, it’s just kind of evolved gradually over time, with many other things getting in the way. 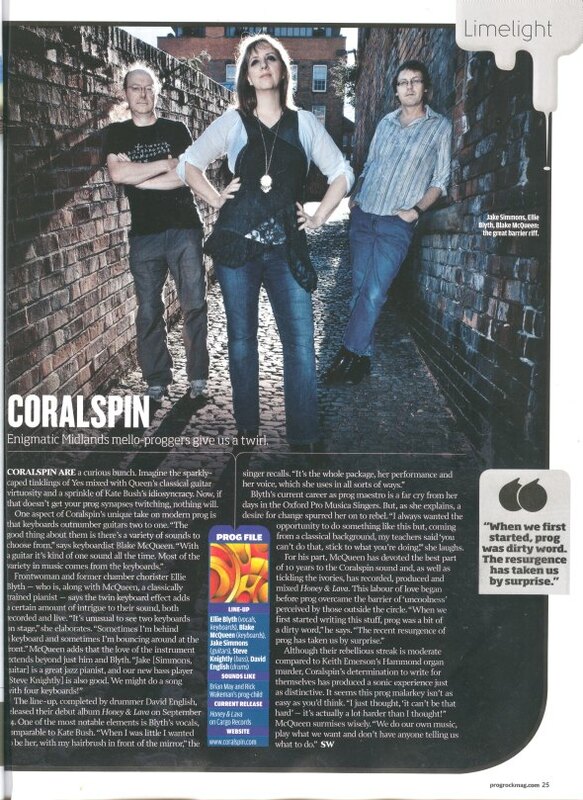 So I think “devoted ten years to the Coralspin sound” is quite a good summary by Sarah, seeing as how hazy I was about it all. When I said “I just thought, ‘it can’t be that hard’ — it’s actually a lot harder than I thought!” I was talking about recording and mixing here, not doing prog. My fault for not making that clearer. We did have a marvellous time talking to Sarah (she’s great, by the way) and I got a bit carried away and didn’t always make myself as clear as I could have done, preferring instead to amuse her and Ellie with wisecracks. “With a guitar it’s kind of one sound all the time. Most of the variety in music comes from the keyboards” — this was a bit of a tongue-in-cheek dig at guitarists, but of course it is an overstatement, so don’t shoot me for it! Some truth in it, though. The printed text says Steve Knightley — actually it’s ‘Kightley’ — is our new bassist, but in fact he’s our old one, who now lives in Bedfordshire (he’s looking for a new rock or prog rock band to join if anyone is interested). We’ll be introducing a new rhythm section hopefully pretty soon. Just when I was getting sick of putting up reviews, here comes an amazing one that I just have to post, so please excuse this further indulgence. It’s by Iain P. W. Robertson, no less, one of the best reviewers around (we talked on the phone a while back, he’s a great guy to talk to). The site is reviewedonline.co.uk, which apparently is one of the biggest review sites in the country. …My current music library is populated by all manner of sounds, so catholic is my personal taste, but prog-rock remains my guilty pleasure and the latest debut album to join its ranks comes from the intriguingly named Coralspin. Unusually, it is a group fronted by a woman, a graduate of Leeds University’s Conservatorium. Ellie Blythe is a talented musician, being a fully-trained classical and operatic performer, who happens to be a dab hand on the keyboards. Joined by Blake McQueen (keyboards) and Jake Simmons (guitar), with a rhythm section consisting of Steve Knightly (bass) and David English (drums), the original trio started to compose some truly exciting sounds. However, as tends to be the case with prog-rockers, there is heaps of intelligence intrinsic to the association and McQueen, as a bit of a technological wunderkind, set about building his own sound-proofed studio set-up. Inevitably, he furnished it with a plethora of keyboards (shades of Tony Banks). However, his talents extended into also building the computers upon which the music would be recorded. Thanks to his intuitive approach, he worked extensively on raising the bar on recording standards, discovering the mastery of mixing and he learned how to produce to the most professional level. Let’s face it, in a market over-populated by home studio recordings and on-line releases of singles, EPs and complete albums, there is little point in trying to rely on the big studios and labels for support… they are all barrelling along on a Cowell-created wave of short-termism. Coralspin’s first album is not merely a taster but is a fully-formed and eminently accomplished oeuvre, possessing an aura of commitment and competence missing from much of today’s readily disposable output and its lyricism is the stuff of genius. Ellie’s voice is hauntingly contralto in its styling, which lends the lyrics a surprisingly familiar tonal quality. The sound is definitely authentic but it leans heavily on the Genesis song-book for inspiration, although there is nothing wrong with that in my book. While the PR blurb suggests that Kate Bush and Sandy Denny influences may lurk in there somewhere, I think that Ms Blythe manages to scythe her own appealing niche in this upper grade stage. Honey And Lava is a brilliantly executed album of just eight different tracks that are delivered richly and smoothly. Of course, in true prog-rock form, none of them is a three-minute radio-play but, fans would not want that in any case. Yet, Coralspin manages to avoid too many ’proggy’ moments, with its unique spin on the rock scene and the lyrical progressions are almost as brilliant as the musical breaks. To cut short such free-formism would be myopic indeed and the listener is taken on a delightful ride from one cusp to the next of musical expressionism that is never less than stimulating and eminently accomplished. Honey and Lava is a fresh take on some well-established precepts and, as a debut album, I sincerely hope that the band has enough drive to take it to the next level. According to Blake McQueen, it already has enough material to create a second and third albums and, yes, there will be the occasionally longer and more complex works to supplement the vista. There is a lot to like here and listening for the second and third occasions just enhances the proposition. There’s a good US prog review site run by author and music historian Jerry Lucky that is worth checking out: jerrylucky.com. He’s just given us a good review, so we have to say that he’s a most astute observer! The challenge with any new band is to carve out a distinctive sound, one that you can clearly call your own. Newcomers Coralspin seem to have succeeded in that task drawing together some rather disparate influences. But then isn’t that what progressive rock is all about? Formed in the late 2000’s the core trio consists of Ellie Blyth (vocals, keyboards), Blake McQueen (keyboards) and Jake Simmons (guitar). Though not officially with the group the sound is augmented by Steve Kightley (bass) and David English (drums). As mentionedCoralspin bring together influences as diverse as Kate Bush and Led Zeppelin to give something quite unique. There’s a total of 37-minutes of music on Honey and Lava; 8-tracks of varying lengths. Things get underway with one of the more proggy tunes entitled “Sons of the Sleeping Giant” [6:59]. It’s the longest track and offers the most musical change-ups. Commencing with some doom-laden power chords then changing to some staccato strumming before the doubled vocals come in setting a rather ominous choral tone. Around the three-minute mark they develop some wonderful cascading runs that have a nice cello tone reminding me of Zep’s “Kashmir”. After a couple key-changes and short musical detours, the band return to the opening section briefly before inserting a somewhat majestic vocal interlude before finally closing the tune with the cello-ish riff. It’s a great tune that is both quirky and musical. Coralspin are a band of many styles and the next track “You’re Wrong” [3:33] opens in kind of a power-ballad fashion, mid-tempo with full emphasis on melodic flow. I must say, the Kate Bush influence is evident on two fronts, Ellie Blyth’s vocals of course, but also many of these compositions are shorter in nature and yet contain lots of artistic elements; subtle arrangements and interesting use of instrumentation. The tunes start off in a certain fashion but never go where you think; the band offer up many pleasant little surprises along this musical journey. Coralspin in their short time together have been gaining much media attention and I think it’s well deserved. Their initial foray into the musical world, Honey and Lava offers much to acquit itself. Balancing some great melodic tunes against some rather artsy or proggy elements provides Coralspin with a sound that is all their own. As a first offering they get full marks from me and I can’t wait to see what they do next. You would do well to check’em out. Jake’s pretty happy about Guitar Techniques magazine praising his playing. I’m happy that they thought us worthy of a review — they only review about 8 releases per issue. Coralspin are Ellie Blyth on vocals and keyboards, Blake McQueen on keyboards and Jake Simmons on guitar, but they are augmented with bass and drums for this album and their collective sound is huge. Their self-penned music is thoughtfully constructed and expansive as they delve into a great melting pot of prog, pop and modern rock. Together since 2008 they have developed a unique sound (although the ending of track four is very reminiscent of early Yes) with great guitar work throughout, particularly on Sky’s End and Night Stalker. With two keyboard players in the band, the keys are clearly a dominating factor, along with Ellie’s somewhat operatic style of singing, but that certainly allows Jake’s excellent guitar to really stand out at the appropriate moments. Prog style music seems to be on the up – no bad thing as far as we’re concerned – so if it floats your boat too then give this a listen – we think you’ll like it.